Coraline moved into the room that was formerly Jameson’s; a gender neutral room in yellow and green. She seems to enjoy the leaf mobile I made more than Jameson did; but like Jameson she adores the little moving black birds over the glider chair the most. 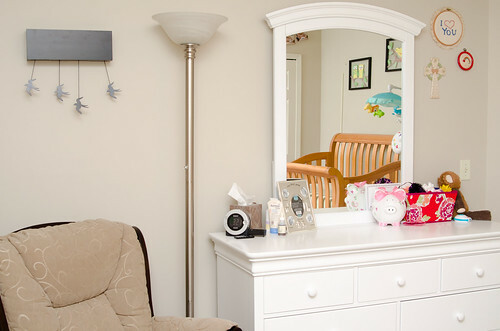 A few differences in her room is the white dresser we purchased for her; Jameson took his with him to his new room. We also purchased a nightstand that will go with it once she is old enough for a big girl bed (we have a pink princess bed from Little Tikes waiting for her). The dresser takes up a lot of space, so there is no room for a bookshelf right now. 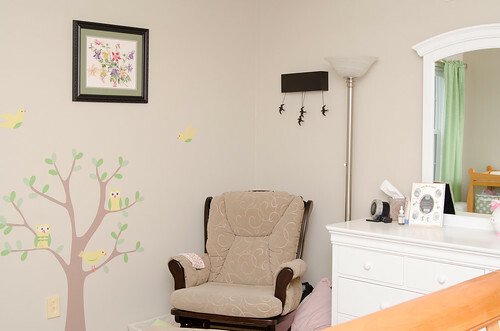 However, there will be plenty of space once we’re done with the changing table, so she will have one in her room eventually. We also have cross stitch work hanging up. The two small circle artwork below are ones that I made for my grandmother; when she passed away, I took them back. Above, the floral work is one my grandma made but never framed. I had it framed and hung it in Coraline’s room. I have big plans for her room once it transitions to a big girl room. I want to have it pink, white and black. I think the black accents will give it a more sophisticated look that will grow with her longer; and I want to limit the pink to the bed and a few other accents so that color can change when she outgrows it. 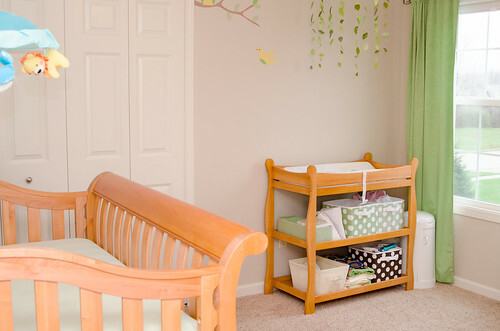 For now, the room is perfect for a baby, and I enjoy the beautiful dresser with extra storage.